If you missed it at Lincoln, you can fly the Trimotor from Stockton Metropolitan Airport October 27-30th. We got a write up from the EAA! We’ve just heard back from the EAA, and we had 827 flights, so we’re now the record holders! If you had Rich take your photo with the Tri-motor, it’ll be here. Thank you everybody for the exceptional performance during the Tri-motor event. By every measure, the event was a huge success and the City of Lincoln was extremely happy with the event. We raised awareness of the Lincoln airport with the local population. In addition, the smiles on the passengers as they stepped off of the Tri-Motor were great. 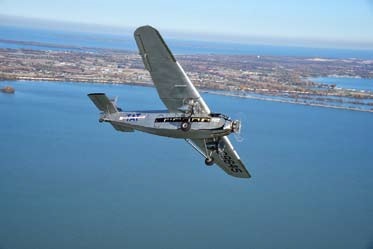 Everyone had a great Tri-Motor experience, and passengers loved the experience of flight on the Tri-Motor. We can be proud of our chapter’s accomplishments. The Tri-Motor will be departing Lincoln this morning about 09:00, but it is leaving behind a new world record for the most flights in a 4 day period. Yes, unofficially the record now belongs to our chapter, and we await final confirmation of the numbers. The previous record stood for 25 years until February, when Chapter 555 from New Mexico flew over 800 passengers. Rand and Colin (the pilots) said that our chapter was the best organized they have ever seen and that all the ground crews did an outstanding job.